Madame Marie Curie is a scientific icon remembered for her pioneering work in the field of radiation research. She discovered Radium and Polonium, defining their atomic weight and their place in the periodic system, and she was the first to discover methods for extracting pure Radium salts and metal. 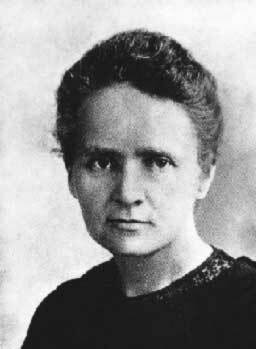 Marie Curie, who first coined the term "radioactivity", was key in developing methods for quantitatively measuring radioactivity and for discovering its effect on living cells. Curie was twice awarded the Nobel Prize, first in 1903 in Physics and then again in 1911 in the field of Chemistry. She was the first person ever to be awarded two Nobel Prizes, and along with Linus Pauling, is one of only two to have done so in two separate fields. In addition, Curie was the first woman in history to earn a Ph.D. at a French university. She is in general remembered for her scientific brilliance and for her diligence and perseverance in the face of tremendous discrimination and hardship. Marie Curie was born Maria Sklodowska on 7 November 1867 in Warsaw, in what was then the Russian Empire, with Poland having been divided up amongst various European nations due to war and subsequent treaties. When she was only 10 years old her mother died of tuberculosis, a short time after her elder sister had died of typhus. Despite this setback, Marie struggled on with her studies, graduating high school at age 15 with impressive marks. Soon after graduation however, she succumbed to depression and had to take a year off, staying with relatives in the countryside. She subsequently returned to Warsaw, and to her educational ambitions, determined to circumvent Russian-imposed laws which prohibited women from attending university and forbade Poles from teaching laboratory science. In consequence, anyone willing to impart knowledge or share laboratory space, even for a little while, became one of her teachers. But she knew she would need a formal degree to advance in any scientific profession. Thus Marie and sister Bronya formed a pact, agreeing to take turns working to raise money while the other traveled west, outside the Czar's reach, to attend university. Through this means Bronya was able to complete her medical degree, and by the time Marie was twenty-four, after several years of working as a governess, Marie was able to move to Paris and enroll at the prestigious Sorbonne. There she found herself woefully behind the other students, but she studied hard in chemistry, math, and physics and within three years time she had earned her Masters degree. It was while she was in Paris that she met and shared lab space with one Pierre Curie, her future husband and collaborator. Ten years her elder, Pierre was Lab Chief for the Paris Municipal School of Industrial Physics and Chemistry, and he had a background in magnetism and crystals. Marie was doing post-graduate research on the magnetic properties of various types of steel, a project financed by an industrial company. The two not only encouraged each other's work beneficially, but fell in love. They married in July 1885. Their daughter Irène was born a couple years later. Marie Curie had no intention of settling down to a traditional life of wife and mother however. Instead she set out to earn her doctorate -– a thing utterly unheard of in France at that time. Pierre's father moved in to help with Irène, and Marie found her imagination fired by the field of radiation research, only just then discovered by Henri Becquerel and Wilhelm Conrad Röntgen. Because so much attention was already on Röntgen's X-rays, she turned her attention to Uranium radiation reported by Becquerel, of which almost nothing was known at the time. Working in the lab she shared with Pierre, she soon discovered that the level of radiation emitted depended only on the quantity of the Uranium contained in a compound, and not on the types of other elements that the compound contained. This meant that the "radioactivity", as she dubbed it, was not the result of a reaction between elements, but was instead the result of something going on within the Uranium atoms themselves. At the same time that Marie was discovering additional radioactive properties—and elements. She found that like Uranium, Thorium also emitted radiation. And as she and Pierre began working together, isolating radioactive elements from a Uranium ore compound called "pitchblende", they managed to uncover two entirely new elements, each highly radioactive. These they named "Radium" and "Polonium", the latter in honor of Marie's native Poland. Their groundbreaking work on the elements and their properties, and their research into potential applications, brought them much needed funding from industry and earned them the Nobel Prize for physics. In addition, Marie earned her doctorate degree, becoming the first woman in France to achieve that distinction. But on 19 April 1906, tragedy struck: Pierre slipped and fell in the street, and his head was crushed under the wheels of a heavy wagon, killing him instantly. Somehow, despite the blow, Marie managed to persevere, bringing her attention back to her research and to the constant effort to find funding. Then, in a surprise move, the Sorbonne offered her Pierre's former post in the Physics department, making Marie their first female professor. Respect for her work continued to grow, especially her work developing methods for Radium extraction, and in 1911 she was awarded her second Nobel Prize, this time entirely on her own right. Unfortunately, in this same period Curie was also embroiled in an ugly scandal over an alleged affair with an estranged married colleague, Paul Langevin. Curie's fame, coupled with a rabid streak of xenophobic sentiment in the right wing faction of the media, caused the incident to inflate to huge proportions. She was vilified in the press, and although she was an agnostic Catholic, Curie was branded a Jewess and further derogated for the racially derived flaws then ascribed to Jews in general. Although the incident took its toll on the already public-shy Marie, she did not flinch from her work nor from her efforts to fundraise and further the vision she shared with late husband Pierre: to map and apply the medical applications of radiation. With the generous help of the Pasteur Foundation and other benefactors she finally founded The Radium Institute. Staffed with a growing retinue of researchers, the Institute was able to follow up on a variety of research areas, increasing the pace of discovery many times over what she could have accomplished on her own. Meanwhile, as World War I erupted, Marie Curie saw the opportunity to use medical radiation to treat injuries from the battlefront. Using tubes of a radioactive gas (now called radon) derived from Radium, Marie set up 200 stationary, and 20 mobile, X-ray stations to help doctors identify and treat bullet and shrapnel wounds as well as broken bones and other ailments. Radon tubes were even used by doctors to destroy a patient's diseased tissue, a foreshadowing of today's cancer treatments. Meanwhile, Marie trained her eldest daughter Irène as an assistant, and she convinced wealthy people to donate vehicles for the mobile stations. She even sold off the gold medals awarded to herself and to Pierre by the Nobel Prize committee to fund the war effort. After the war she continued her fundraising for the Radium Institute, even traveling to the U.S. in 1921. There, in addition to donations and publicity, she received a gift of one gram of Radium –- a gift that effectively doubled her research supply of the costly substance. By 1934, Curie's health was failing rapidly. The toll of heavy exposure to radiation was at last overpowering her impressive constitution. She did live to see Irène and son-in-law Frédéric Joliot-Curie discover artificial radiation, but not long enough to see them win the Nobel Prize for Chemistry for this achievement. On 4 July 1934 she succumbed to aplastic anemia, or leukemia, induced by radiation exposure. She was buried alongside husband Pierre, and in 1995 the pair were exhumed and reburied at the Panthéon in Paris, an honor accorded only to France's most esteemed citizens. Other honors accorded Curie, in addition to her two Nobel Prizes, include numerous honorary degrees, an assortment of biographies (including Madame Curie written by her younger daughter Eve), and her portrayal in a 1943 film. Starring Greer Garson and Walter Pidgeon, the film received an Oscar nomination. Curie's likeness also appears on a variety of coins and other currency as well as on a number of stamps. An asteroid, 7000 Curie, bears her name. And Curium, the 96th element in the periodic table, is named in honor of both Marie and Pierre Curie. In addition she has been the inspiration for innumerable young scientists, and was of great influence on her peers including Albert Einstein. Curie was never a Polish citizen, though her family were Polish nationalists. At the time of her departure from Warsaw, the Polish state simply did not exist. Because of her gender, the Russian-Polish scientific establishment rejected her entirely, and by necessity she became educated in France and joined the French scientific community. Curie spent her entire adult life in France, married a French chemist, and became a French citizen.